Traditionally, the Japanese, being within the sphere of Chinese cultural influence, have respected old age and celebrated long life. Back in the Nara Period (710-794), when the Japanese aristocracy was keen on almost anything Chinese, numerous continental beliefs and customs were enthusiastically adopted JUST AS THEY WERE. Among these, were concepts and rituals which have a major impact TO THIS DAY on Japan’s annual cycle of events as well as its life-cycle celebrations and ceremonies. It was at this time that Japan’s elite began to mark the attainment of OLD AGE beginning at age 40! In those days (and until quite recently in fact) it was said that “a man’s life is 50 years” (人生は５０年、 Jinsei wa goju-nen), and there were special celebrations held upon entering each new decade of life (these were called yonju-no-ga, 四十の賀, for the 40th year, goju-no-ga, 五十の賀, for the 50th year, etc.). This involved a banquet at which relatives of the person being celebrated gathered for a festive meal and the pounding and distribution of fresh mochi (rice cakes). As Chinese cultural influence in Japan waned and the Japanese gained more self-confidence over the ensuing centuries, the customs regarding the celebration of longevity, along with almost everything else adopted from China, were eventually given a uniquely Japanese twist. Records show that the still standard series of eight special birthdays celebrated between (and including) the 60th and 100th years had been firmly established among the Japanese ruling warrior class and the aristocracy by the Muromachi Period (1338-1573). Instead of merely following the original Chinese lead of celebrating the start of each new age-decade, the Japanese also selected certain ages from which auspicious (or amusing) meanings could be derived from how the ages were written in Kanji characters. Thus, today we have the following. The 60th year (kanreki, 還暦), meaning a return to the beginning of the cycle, as it heralds completing the path through the full five cycles of the Sino-Japanese zodiac (jikkan-junishi), and coming back once again to the original combination of signs that you were born with. This event is commonly celebrated throughout East-Asia. The 70th year (koki, 古希), the name of which derives from a popular verse by the great Chinese poet Tufu (Toho, 杜甫, in Japanese). The poem goes: Jinsei nanaju korai mare nari (人生七十古来稀なり),meaning that (in those days) reaching the age of 70 was a rare occurrence. The 77th year (kiju, 喜寿）, which was celebrated because an archaic form of writing the character ki (good fortune, this form cannot be written out with this computer), can be broken down to the components 七　十　七、 which means 77. Because of this round-about connection, that age is seen as related to GOOD FORTUNE. The 80th year (sanju, 傘寿). The character 傘 (umbrella) can be broken down to components which can be rearranged as 八十(eighty). The 81st year (hanju,半寿). The character 半 (half) can be broken down and rearranged as 八十一, or 81. However, celebrating hanju has become extremely rare these days. The 88th year (beiju,米寿). The character for rice, 米, which symbolizes wealth, nutrition and other wholesome things can be broken down to its basic components and rearranged as 八十八、or 88. The 90th year (sotsuju, 卒寿). The character 卒 (graduation) can be rearranged as 九十、or 90. The 99th year (hakuju,白寿）. When the element meaning one (一) is removed from the top of the character 百 (100), you get the character haku (白,white). Thus haku is 100 minus one. In other words 99. Then, at the 100th year, there is hyakuga (百賀), and after that a celebration every year (hyaku-ichi no ga, etc…). During the Edo Period (1603-1868), the custom of celebrating these special ages filtered down to the common people, though even for the easy living elite it probably still remained quite rare at that time to celebrate anything beyond Kanreki (the 60th year). Since Kanareki marked the completion of a full journey through the oriental zodiac and a rebirth, or return to childhood, 60 was traditionally the age at which men would retire. The main feature of the kanreki banquet was the presentation of a red coat (chanchanko) and cap (zukin). This style of garment symbolizes a return to childhood. The red color represented warmth and was also believed to have powers to ward off evil and bad luck. 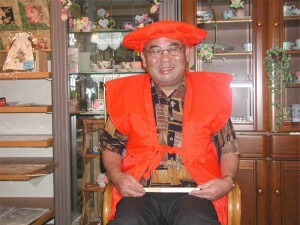 The cushion (zabuton) on which the guest of honor sits, should also be red. A red fan might also be provided. You can find everything you need online. These days of course, most 60-year-olds in Japan are still working, and most likely feel that their whole life still lies in front of them. They might be embarrassed by the silly chanchanko and cap. Still, if you decide to give a sweater or blanket, shirt or tie, red would be an appropriate (traditionally speaking) color. 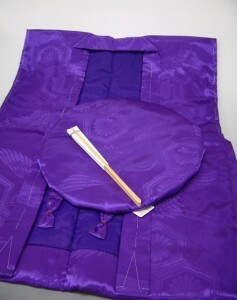 For Koki (70) and Kiju (77) celebrations, the color purple is considered appropriate, as it is the mostly highly regarded color in Sino-Japanese divination (omyodo). This color provides protective and curative benefits to those bodies which might just be starting to feel the aches and pains of age. Though once extremely rare, sanju (80), hanju (81), and especially beiju (88) celebrations are now common events! 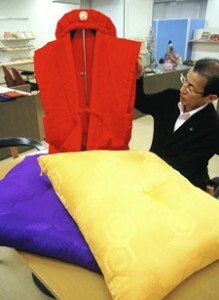 The color for presents, clothing and cushions should be GOLDEN BROWN (kincha iro 金茶) or yellow. And since 88 years of age is associated with RICE (米,bei) with all its positive associations in Japanese culture, beiju celebrations are popular and feature several special gift items. 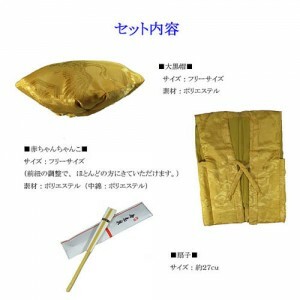 Golden brown (or yellow) furoshiki or fukusa cloths and zabuton cushions with cranes or the character 米 on them are usual. The most interesting traditional gift for beiju is a HATO NO TSUE (a walking stick with a pigeon carved on the handle). It seems that giving such a gift was practiced in the ancient Chinese and later Japanese courts. Among the reasons for such a gift being appropriate are that HATO (pigeon) can also be written using the characters 八 and 十, which can also mean 80. It is also said that pigeons do not choke (a serious problem for the elderly in Japan, especially with New Year’s O-Mochi). These pigeon-handled walking sticks can be given at any of the longevity celebrations for someone in their 80s. Have a look at a hato no tsue here. For sotsuju (90) and hakuju (99) celebrations, the appropriate traditional color is white. Have a look at each age group color. In contemporary Japan there are dozens of reference books available for those wanting to hold, or for those who have been invited to, a special LONGEVITY birthday celebration. They not only recommend appropriate gifts such as travel or restaurant coupons, ceramics or electronic equipment, but also detail the correct way to address the special festive envelopes and recommend appropriate amounts for cash gifts. One thing that all these books agree on is that the most important point, especially for the older-age celebrations, is to bring family together, create a warm and festive atmosphere, and maybe have an extended family photo portrait taken. Commemorative gifts should also be given to all those who attend. These parties can be held at home, though usually a restaurant is reserved and special celebratory dishes served, for example fish (TAI) or sea bream. This might all sound quite simple. However, a more detailed explanation of these customs might set your head spinning. For example, individual birthdays were never actually celebrated in Japan (except for a divination ceremony, isho mochi, held on the first birthday). All Japanese grew a year older on New Year’s Day. Thus, these celebrations were not actually held on the celebrant’s birthday, but on New Year’s or another auspicious day. The situation now of course is quite different and the celebration of birthdays has become as popular (for younger people) as it is in the West. Another complicated point is that until this century the Japanese considered themselves to be 1 year old at birth. If they were born a day before the New Year, they would be considered 2 years old after the New Year, when by contemporary standards they would be just 2 days old. The traditional way of counting ages is called KAZOE-DOSHI. Many older people still use this term when talking about age. In fact, while now the other longevity celebrations are usually based on Western-style age-counting (MAN NENREI), Kanreki (60) is still counted as 61 years in KAZOE DOSHI. If you are confused, you are not alone. Anyway, with the average age in Japan skyrocketing, the events I’ve just told you a little about are being held more than ever before, by a huge margin. A celebration of the once extremely rare has become commonplace.